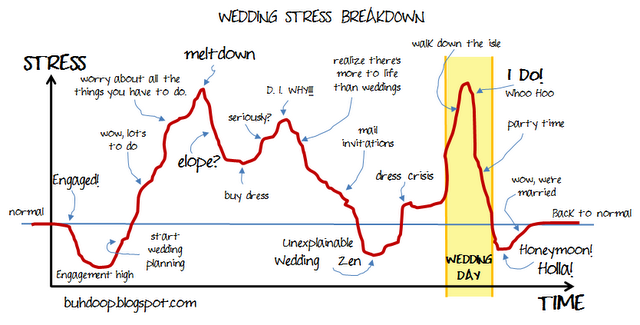 Whether its the pre-engagement stress of the would be groom, or the inevitable stress of the bride-to-be, the stress before a wedding is an opportunity. Every marriage will experience unwanted, surprise times of stress. If a couple can get into the habit of dealing with stress at this point, it will prepare them for the future. 1) Find time to communicate. You need to set aside relationship time - face-to-face, putting aside distractions, in order to make the space necessary to hear each other. Nothing adds to stress like bringing up issues and hard decisions without time to be heard. Brew a pot of tea, open a bottle of wine and sit with your lists, with an openness to hear and understand the other for an hour or more, at least once a week, more if you time. 2) Find time for yourself. Yes you need to get the lists done, but you will not be able to function well if you are depleted. What brings you joy and life? Look at your weekly calendar - look at today - and see where you can find a few moments to enrich your life. It might mean less veg time, but if you are energized, you'll need less veg time anyway! Look at the stress you are facing as an opportunity to learn how to be a team, to practice for the future. Remember, this is for the long haul!